Provide an end to end solution for the ‘delivery to consumer’ needs of a fast-growing organisation for their online food ordering platform. The solution must strongly brand the organisation and be fit for purpose and sustainable. Deliveroo were having issues with their food delivery bags, as it was just a paper bag that could tear, get soiled, or be damaged due to damp, condensation from the food and drink they were transporting. This resulted in a poor delivery experience to consumers, who were less than satisfied to receive their often-high-end restaurant quality meals in this form. Along with this, due to the increase in restaurants joining Deliveroo’s service, there was a logistical nightmare created with the distribution of the delivery bags to the volume of restaurants. This was no ordinary task. Team Impact considered the challenges and presented them with a totally different idea, that wasn’t just ANOTHER paper bag! We used our creative thinking and presented a waterproof, reusable, recyclable and cost-effective carry bag! It had exceptional durability, 25kg weight capacity, along with a much higher quality print, which would allow for greater brand exposure. A massive win for the client, who loved the concept. But we didn’t stop there. 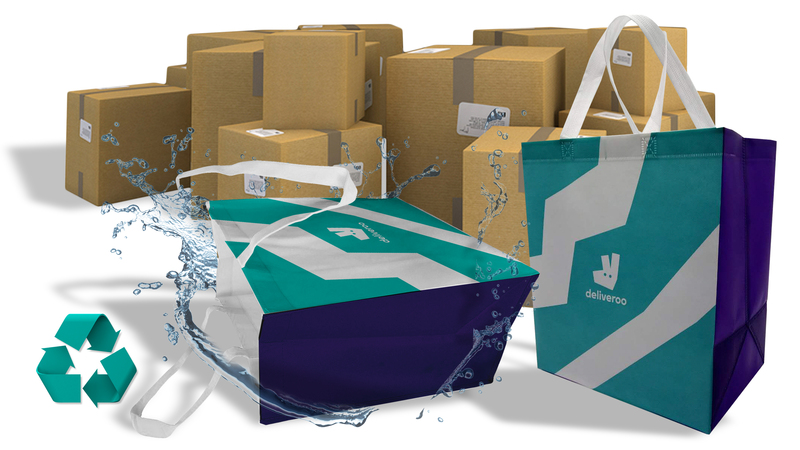 We created an online inventory control portal that allowed Deliveroo restaurants to log on and order cartons of the bags to be delivered directly to their doors, eliminating all the time and effort that Deliveroo staff had previously spent. Now over 1.5 million bags have been produced and counting, delivering to over 2,000 restaurants and food outlets in every corner of the country.